Electronic interfaces have advanced from plugging things in, to keyboards, touchscreens, VR environments, and perhaps soon temporary tattoos. Led by Martin Weigel, researchers at Saarland University in Saarbrücken, Germany have come up with a way to turn your skin blemishes and wrinkles into touch-sensitive controls for devices like smartphones and computers. “SkinMarks” can be transferred onto the skin using water and last a couple of days before rubbing off. As seen in the video below, these e-tattoos can take the form of buttons, sliders and visual displays, and even sense when a joint is bent. For example, knuckles on a hand made into a fist could act as buttons and then become a slider when the fingers are straightened. Another type of SkinMark is electroluminescent, meaning that an image printed on your skin could light up to signal a phone call or other important notifications. 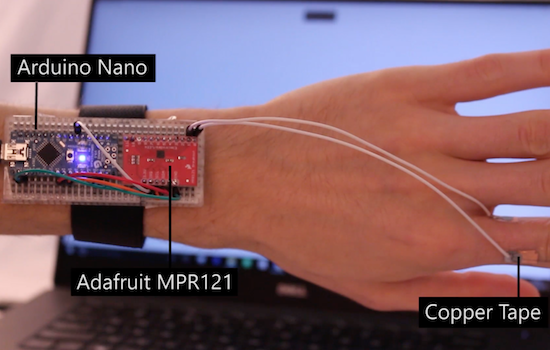 These tattoos are connected to a wrist-mounted Arduino Nano and an Adafruit MPR121 capacitive touch shield via wires and copper tape; though if the system can be shrunk down even further, this could open up many different possibilities! You can find more information on this project on New Scientist, or in the team’s published paper here. 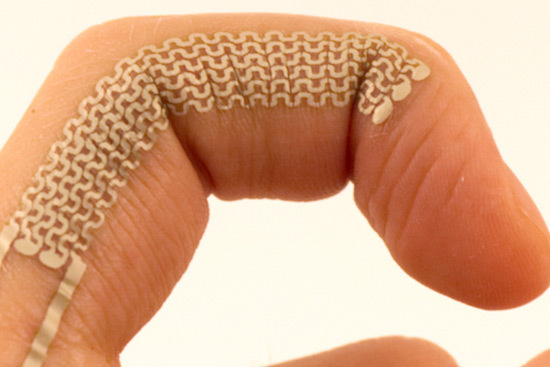 There is a company that provide these skin circuits?